It’s always a good day when Zen Studios releases new pinball tables. 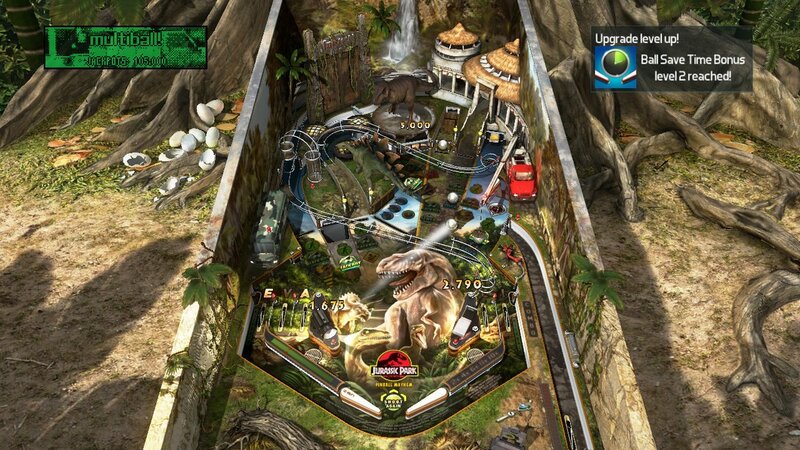 This week, on Pinball FX 3, we’ve been treated with three new pinball tables based on the Jurassic Park franchise (called "Jurassic World Pinball"). And they’re delightful. Like with the earlier Aliens and Predator tables, there are three in this pack, and they’ve been carefully selected to reflect the full franchise, from the early days right through to the recent film. As with the Aliens and Predator tables, the one based on the early days of the franchise is delightfully nostalgic and 80s in design. The later tables are far, far more modern in aesthetics. Related reading: Matt's review of Pinball FX 3 on the Nintendo Switch. 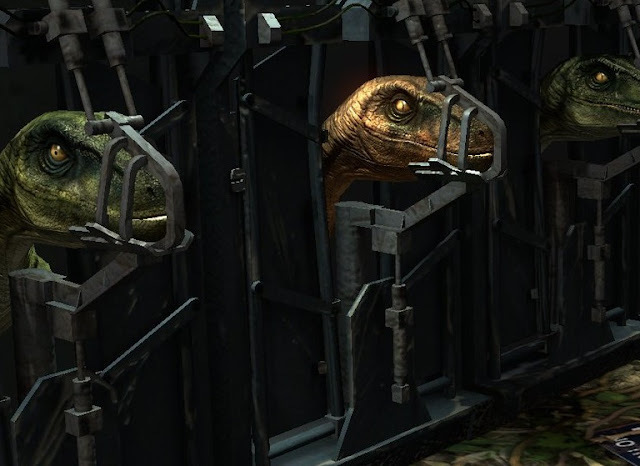 Across all three tables there are so many dinosaurs and iconic moments from the films that it comes across as a real celebration of a very beloved franchise, and only further cements the idea that Zen Studios really puts the extra effort in to understand the franchises that they’re depicting. There aren’t licensed games that do a better job for the base franchises, it must be said. I do have an issue with these tables, and it’s a trend among Zen Studios’ tables that I’ve been meaning to address for a while, but it’s especially an issue here. Scoring is too easy. Days after release and my own local friends leaderboards have a bunch of people with scores 50 million and above. Now those people are the ones that top the leaderboards on every table and have scores I know I’ll likely never catch, but when you look at earlier Zen Studios tables, completing an objective and getting that bonus 1 million points was a real achievement. Here, a million score seems routine, and actually doing what the game asks to score it is too easy. I’m assuming that Zen Studios has figured out that people look at their end scores on these tables and feel like it’s been time well spent, but to me it’s something of a disincentive to actually practice at a table until I’ve learned the ins and outs of it. Pinball is pinball and no table is really more, or less, easy than the others. Functionally they are as challenging as one another, and the difficulty comes from how readily the scoring system rewards you. These Jurassic Park tables are designed gorgeously, but they don’t feel anywhere near challenging enough. Still, I laughed out loud when one “mission” on one table had me using a stegosaurus tail to whack the ball into a building’s windows to try and hit targets. I couldn’t help but feel nostalgic for the way the game recreates the iconic T-Rex attack on the tour cars from the first film. Zen Studios has really pushed these tables as far as pinball can be pushed while retaining the form of a pinball table, and the team has perhaps done that better here than in any tables it has previously crafted. I don’t mean to imply that they’re not a delight to play, because they are. I just wish there was a bit more of a sense of challenge from them. 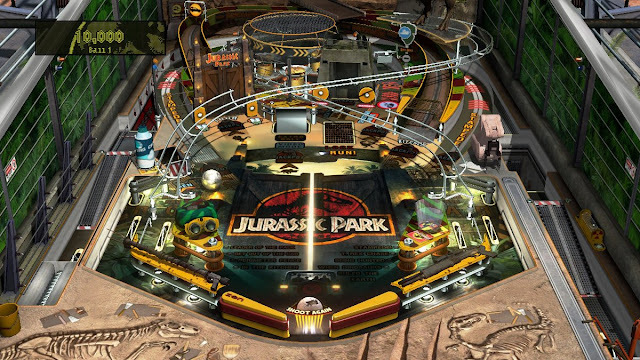 And, as glad as I am that there are now Jurassic Park pinball tables, It’s also hard to push past the sense that Zen Studios is now running far too safe with its licenses. It keeps tapping back into the same western blockbuster film franchises – Star Wars, Back to the Future, Jurassic Park, Marvel, Jaws, Aliens, and now Jurassic Park. It’s hard to deny the appeal of these, but it would be nice to see the team spread its wings a little and look to some different properties, too. Get some manga or anime licenses. Rock music has been a popular theme for real world pinball tables, so get a couple of music acts and build a pack around them. Heck, throw a bit of culture at people and give them some tables based on literature classics. Or buddy up with some Japanese developers and publishers and make some tables based on those properties. The Ninja Gaiden table from back on Zen Pinball 2 was amazing. Tap Koei Tecmo again and make a Dynasty Warriors, Dead or Alive and Nioh table pack. Or, even better, talk with Sega and finally produce that Sonic/ Hatsune Miku/ Persona table pack I’ve been asking for for years now! Jokes aside, the biggest issue that Pinball FX 3 has is that its licenses are lacking in thematic diversity, and while the original tables that Zen Studios produce helps to an extent there, the company is still looking down the barrel at becoming stale at this point. I’ll still play everything that the company produces, because they’re all exceptional examples of pinball design, but I also really want to start seeing more variety.